Easter is the time of year where Cadbury dominates the shelves with their differently heavenly varieties of chocolate. I am seriously addicted to the Cadbury Mini Eggs. They release every year right after Valentine’s and I hunt through the store, throwing bags into my cart and not even waiting until I get home to rip them open and start chowing down. Seriously, they’re that good. I’ve been better about what I’ve been eating this year, so Cadbury’s new ten dollar industrial bag of the eggs never made it into my cart. 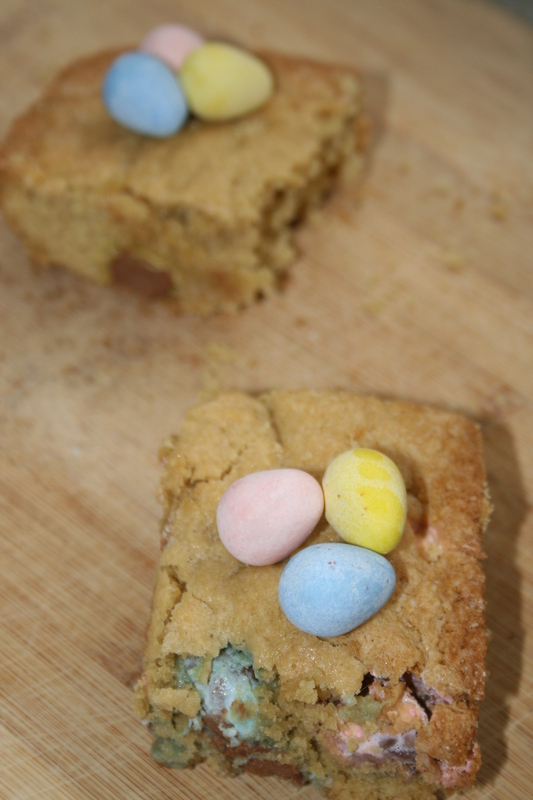 I still needed my holiday fix though, and I ran across this recipe – Cadbury Blondie Bars. 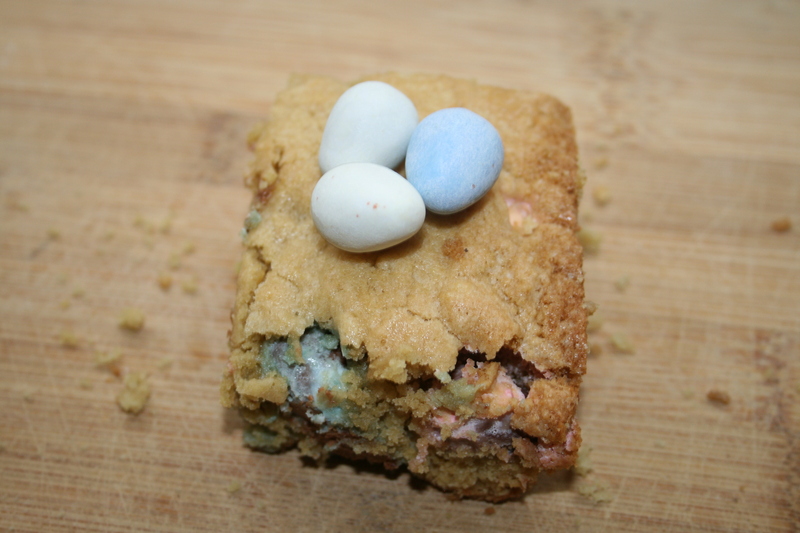 Blondie Bars by themselves are a win, so putting my favorite Easter candy in them could only make them better. The batter preparation was quick and easy, and the finished product was worth cheating on my faux diet for. 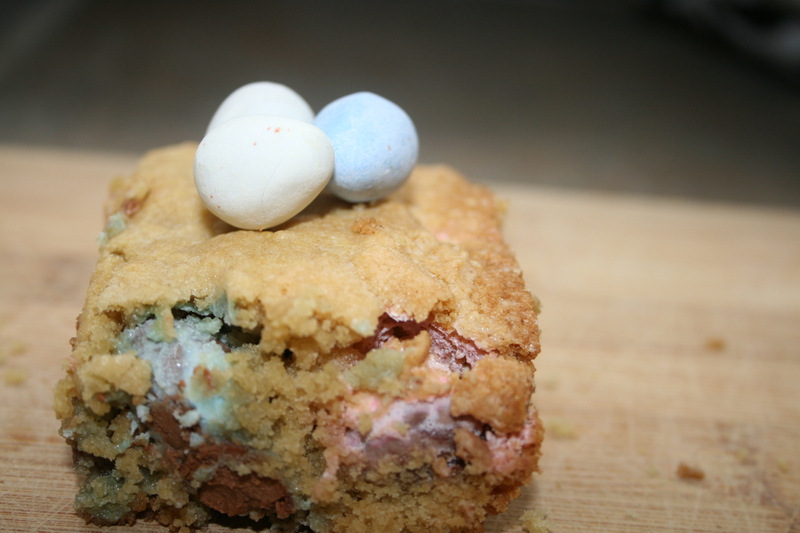 Next year I’ll be stocking up on enough Cadbury mini-eggs to make this recipe year round. 2. Mix together all ingredients excpet the Cadburys in a mixer or bowl. 3. Slowly add the chocolate eggs to the batter. 4. Pour batter into 8 x 8 greased baking dish and bake for 40 minutes. 5. Let the blondie bars cool for 30 minutes before slicing. Do you feel a new Easter tradition coming on? I sure do. Leave a comment with your favorite Easter candy below!